God created us with great care. He designed our body for 100 years. Today we are seeing many people suffering from Kidney Problems. Symptoms of kidney failure are due to the build-up of waste products in the body that may cause weakness, shortness of breath, lethargy, and confusion. Inability to remove potassium from the bloodstream may lead to abnormal heart rhythms and sudden death. 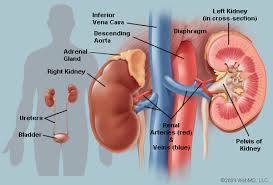 Initially kidney failure may cause no symptoms. If the kidneys fail completely, the only treatment options available may be dialysis or transplant.